Diagnostic and therapeutic protocols have been developed for many diseases and determine daily medical practice. In Andrology though, despite having guidelines set by International Societies, there are no official diagnostic and therapeutic protocols; and it is not foreseen that there will be such protocols developed for any urologic disease other than prostate cancer. In an effort to develop therapeutic protocols for the most common diseases in Andrology, the Sexual and Reproductive Health Center (SRHC), which has completed 20 years of operation, along with the organizational support and know-how of the Institute of the Study of Urologic Diseases (ISUD), takes the initiative to establish a Task Group that will draft proposals for therapeutic protocols for the most common diseases of male infertility and sexual dysfunctions. For this purpose, SRHC and ISUD have invited colleagues Urologists whose daily clinical and research practice is primarily dedicated to Andrology issues, to contribute to the above effort. The methodology adopted for this venture was the methodology that is officially used for all therapeutic protocols set up by Scientific Committees of the Ministry of Health. In the initial phase, each one of the Workgroup members was assigned with one protocol and was asked to carry out a review of the relevant literature. Based on their personal experience and taking into account the existing infrastructure conditions of the country, they were asked to propose a realistic diagnostic and therapeutic algorithm. This algorithm will be judged by two other members of the Task Group who will operate as independent reviewers. What clinical data are required? What paraclinical data are required? 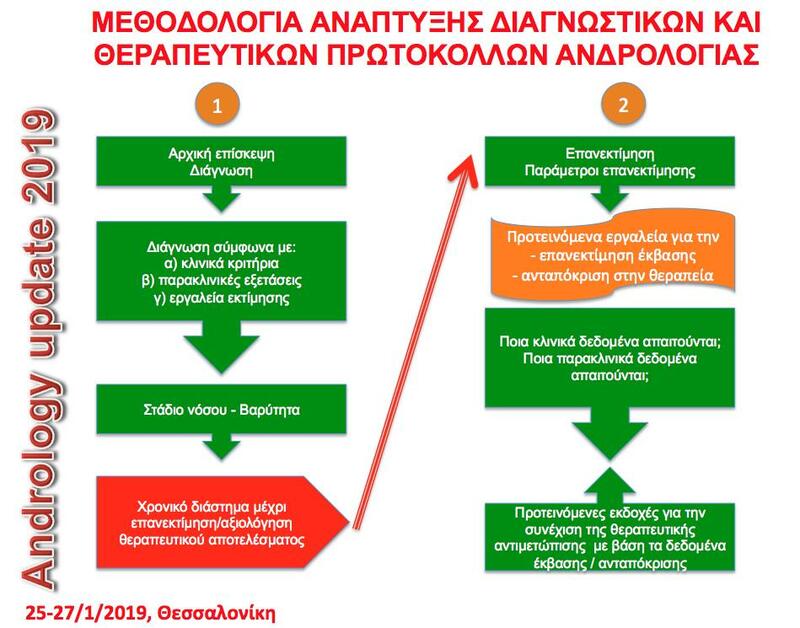 This algorithm will be presented in Andrology Update 2019, which will be held in Thessaloniki on 25-27 January 2019. Every member of the Task Group will present their proposal/ algorithm, which will be optimized through an interactive procedure. Following Andrology update, the protocols will be completed and their final form will be published/released by IMOP. We invite you all to contribute to this highly significant initiative of SRHC/ ISUD with your active participation, to the benefit of all colleagues Urologists but mainly to the benefit of all men with sexual and infertility problems.